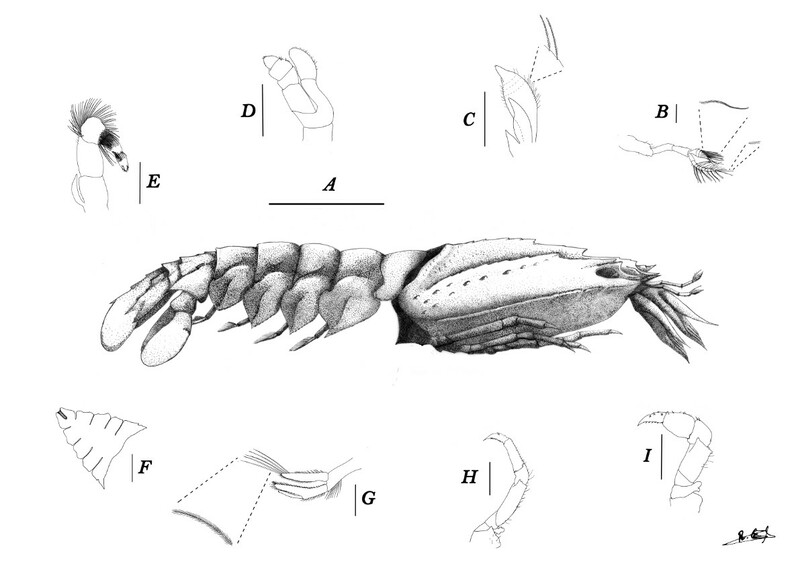 Achelata lobsters are classified in two main families, Palinuridae, commonly known as spiny lobsters, and the Scyllaridae or slipper lobsters. His life cycle consists of a benthonic phase for the adult and a long planktonic larval phase. These two periods are linked by transitional stage, a post-larva known as nisto for Scyllaridae family and puerulus for Palinuridae family. The post-larval stage is known poorly due to the few specimens obtained in plankton samples and only a few specimens have been described. Fig: (A) Nisto; (B) antennular flagellum; (C) maxilla and first maxilliped; (D) second maxilliped; (E) third maxilliped; (F) sternum; (G) pleopod; (H) second pereiopod; (I) first pereiopod. Scale bar: A = 5 mm; B-E and G = 1 mm; F = 2 mm; H and I = 20 mm.